Florida Gators quarterback Will Grier talks to the offense during the 38-10 win over Ole Miss. He went 24 of 29 with 271 yards and four touchdowns. GAINESVILLE, Fla. — Florida fans are gushing about the program’s revamped offense and the play of redshirt freshman quarterback Will Grier the past two games. Meanwhile, labeled boring and irrelevant in recent years, the Gators are suddenly a media darling in the wake of their stunning victory over Ole Miss. 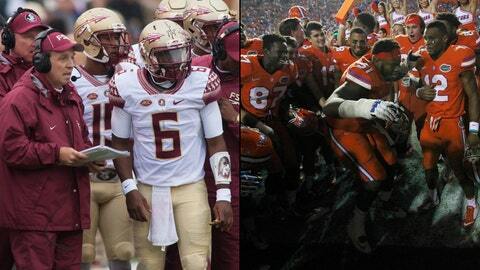 A headline Wednesday afternoon on ESPN.com: Man versus Metric: Is Florida the favorite to win the SEC? The season of unexpected surprises is only five games old, the same age as the Jim McElwain Era at Florida. What isn’t a surprise is the way the Gators defense has played. Loaded with a sound mix of veterans and talented underclassmen, most figured the defense left behind by former head coach Will Muschamp was good enough to keep the Gators in most games during McElwain’s inaugural season. If the offense chipped in with a touchdown here and there, the pundits projected Florida as a middle-of-the-pack SEC team with a chance to go to a lower-tier bowl game. And then a win at Kentucky, a comeback against Tennessee, and a rout of Ole Miss happened. Unranked two weeks ago, the Gators are now ranked 11th as they prepare to play at two-time defending SEC East champion Missouri on Saturday. The biggest question facing Florida this week isn’t whether Grier or Treon Harris will start at quarterback, or if the Gators have enough talent at receiver to make a difference, but how will they respond to the outbreak of orange-and-blue fever. "They should get their bellies rubbed," McElwain quipped. "I mean, they’ve done a good job. And yet how do you handle it? It’ll be interesting." What else is interesting — at least to those who have closely observed Florida’s recent rise — is the way McElwain, a longtime offensive coordinator prior to becoming a head coach for the first time in 2012, manages public perception of Florida’s improved offense. While Gator Nation is as excited about Florida football as it has been since 2009 — in large part to the promise shown by Grier and the offense — McElwain has kept his praise of the offensive improvement to a minimum. He said Florida’s 38-10 victory over No. 3-ranked Ole Miss "was as good a defensive performance as I’ve probably ever been around." Florida will see if new-found prosperity travels to Missouri. Florida flies up to No. 11. The Gators defense set the tone early and often, forcing four turnovers that led to 19 points for the offense. Through five games the Gators rank fifth in the SEC in total defense (304.2 yards per game), second in rushing defense (97.8 ypg), third in scoring defense (16.6 points per game) and ninth in pass defense (206.4 ypg). But Florida being Florida, those who pack The Swamp on Saturday nights savor offensive fireworks more than those sold on the Fourth of July. For example, take the Gators’ 13-play, 91-yard drive to end the first half on Saturday. The Gators led 19-0 when they took over at their 9-yard line following a punt with 4:50 left before the half. Over the next 4:30, Grier went 8-for-8 for 68 yards, his final throw a 15-yard touchdown pass to Antonio Calloway that gave Florida a 25-0 halftime lead. "You’re supposed to do that," McElwain said. "You have the plan, now go execute it." The drive sent Florida fans into a frenzy on social media and caught Missouri coach Gary Pinkel’s attention as the Tigers began to prepare for the Gators this week. Pinkel said Wednesday the new-and-improved Florida offense looks formidable on tape. "They’re playing at a whole different level then they’ve played in the past," Pinkel said. "I think [Grier is] the difference. That’s the spot where the guy touches the ball 75 or so times a game and that guy really is going to have the influence on the success of the team. He’s really playing well and I’m impressed." 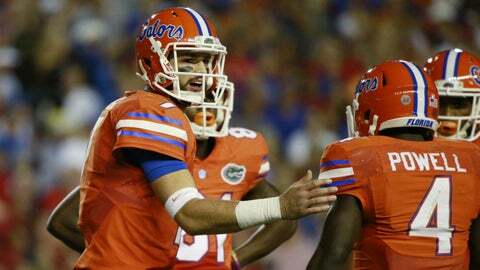 Florida’s defensive players back up Pinkel’s assertion. They see Grier and Co. in practice each day and have been tested more and more as the season has progressed. "It’s 10 times better," safety Marcus Maye said. "Going against each other every day, you’re seeing new things. You can tell those guys are loving what they’re doing out there, having more fun." Grier has created the separation from Harris that McElwain and offensive coordinator Doug Nussmeier sought since the two opened their competition during spring camp. Grier finished 24 of 29 for 271 yards and four touchdowns against Ole Miss, joining Tim Tebow as the only UF quarterbacks in the last 20 seasons to have two games in the same season with at least 160 passing yards, two passing touchdowns, no interceptions and a completion percentage of 80 percent. Of the eight SEC quarterbacks who have accomplished the feat since 1996, Grier is the only freshman. Grier was 16 of 18 for 166 yards and two touchdowns in his college debut against New Mexico State last month. 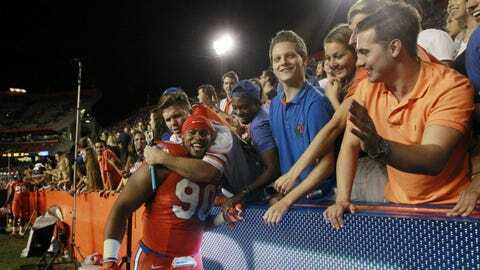 "Will has definitely grown," Gators center Cam Dillard said. "He’s a good leader. He knows how to win and get us on the right page and make sure everyone is communicating and that everyone knows what their assignment is." In his breakdown of the offensive performance against Ole Miss, McElwain said Grier made some positive strides. He was quick to point out those around Grier have also improved. Overall, Florida is 10th in the SEC in total offense (394.2 ypg), seventh in scoring (34.4 ppg), sixth in passing (253.6 ypg) and 12th in rushing (140.6). The much-maligned offensive line, which featured only six scholarship players in the spring, deserves significant credit. Newcomer Mason Halter, who transferred from Fordham for his final year of eligibility, said the offense’s production has been a collective effort. "It was a defense-minded team when I got here and I think we still are a great defensive team as we saw this past week," Halter said. "But offensively, as a unit, we’re just meshing really well, which is growing our confidence. We’re getting great play calls as well. Coaches are doing a great job coaching us up." McElwain wants more. Based on where the Gators stand in the conference rankings, there is obviously room for improvement. "Offensively, you know, we’re starting to do some things," he said. "We still have so far to go." At the same time, the offense has already come so far.